Tukad Gelar is a name of a river in the village of Batu Agung, district of Negara, Jembrana. This river is one of the best rivers of several rivers in Jembrana. Tukad Gelar is attraction for local residents. The river is also a public bathing place for residents. Unfortunately, the degree Tukad used as a bawdy by the young couple. The river is considered to be a very nice location for making love. Because it is in a protected forest area surrounded by clove plantations belonging to local residents. Almost every day the river is visited by a young couple to make love. Often seen a pair of young lovers kissing on a rock, in the bushes, among the trees. Making love in Tukad Gelar is a wonderful experience for young lovers in Jembrana. The location is very quiet, comfortable, quiet, fresh, with the river water is very clean and clear. Tukad Gelar very crowded by people because the river is very easy to accomplish. Has provided the way to get close to the river, although it is in between the mountains and forests. Unlike other rivers in Bali. 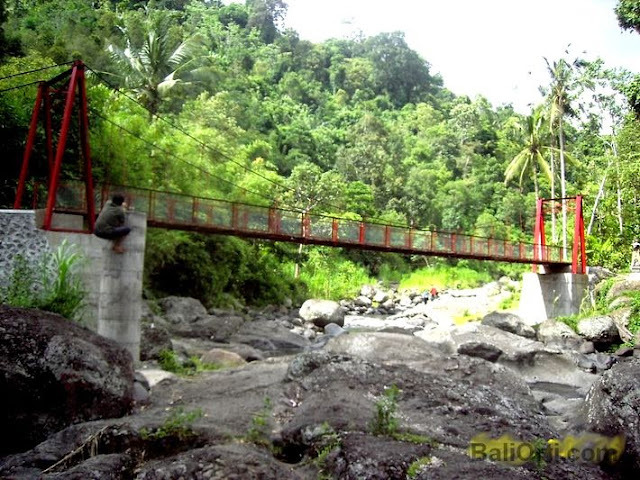 One of the icons on Tukad Gelar is a suspension bridge. The bridge connects two different villages. Although the bridge is not the only way. The bridge is also often used for shooting when selfie background.